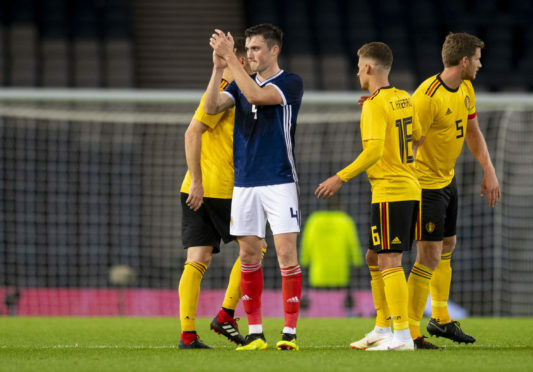 John Souttar made his debut for Scotland against Belgium on Friday. Hampden Park witnessed a classy Belgium stroll to a four-goal victory and Hearts defender Souttar, who was up against the fearsome front three of Eden Hazard, Romelu Lukaku and Dries Mertens, treats it as a huge learning experience for the tests to come. Lukaku gave Belgium the lead in the first half, with Hazard doubling the advantage 51 seconds into the second period and Michy Batshuayi adding a brace to put a gloss on the scoring. Three of the goals came from mistakes from the home side and the saving grace is that teams of the quality of Belgium – ranked second in the world – will not come across Scotland’s path often. They start their Uefa Nations League campaign on Monday against Albania in Glasgow, with Souttar knowing levels will need to be raised ahead of the competitive action beginning. “It was always going to be a hard test but it’s one you’ve got to enjoy. Test yourself against the best. Obviously the result was poor and a lot of stuff wasn’t great but there were a few things which looked positive. Monday night is the big one and hopefully we take the positive stuff to Monday. “Yes, it was the biggest by far. It was a learning curve for me playing against them. I felt good and I enjoyed it. I felt that we did some good stuff in the game but the result obviously dampens it. “Monday will be a completely different game. Belgium are second in the world for a reason. They are a top team and you saw in the World Cup how good they are. They knocked Brazil about the park and it was always going to be tough. To test yourself against that at this stage of my career is brilliant. Albania won their opening game last night 1-0 and are bossed by Italian Christian Panucci, who scored the goal that prevented Scotland qualifying for Euro 2008.